Heartworms, ticks, and fleas increase during the summer which can cause serious health issues for your pet. Contact your veterinarian to discuss which products are best to keep your pet healthy this summer. 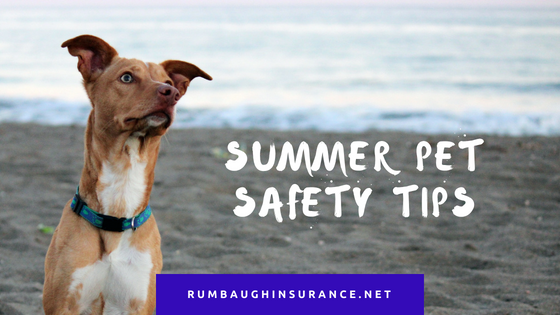 You might think that a dog or cat’s fur provides sufficient protection from the sun; however, you should use a sunscreen specifically for pets. Apply it to the least hair-covered spots every 3-4 hours (not necessary to apply sunscreen on fur). The most sensitive area for a dog is the stomach and cats are most sensitive on their ears and around the eyes. Skin cancer is the second most common form of cancer in cats and the most common form of cancer in dogs. Avoid human sunscreen as it contains ingredients like zinc oxide which can be toxic to animals. Never leave your pet in the car during the summer! Even with cracked windows, it takes as little as 7 minutes for the interior temperature to increase by 19 degrees. This could be deadly on a hot day. Avoid walking a dog between 1 p.m. and 4 p.m. which is the hottest and most humid time of day. Pets can experience heat exhaustion just like humans so take caution with your pet in the intense summer sun. If you see signs of heat stress—thick drool, heavy panting, vomiting, dry or bright red gums, wobbly legs, or diarrhea—don’t place your pet in ice cold water as it causes more harm than good. Move him/her to a cool place, cover her with a damp towel, and get her to the vet as soon as possible. According to veterinarians, you should resist the urge to cut your pet’s coat short for the summer. Hair, even long hair that is brushed, provides optimum circulation and helps to regulate your pet’s body temperature. Fireworks contain chemicals that can cause vomiting, seizures, and shallow breathing if ingested, as well as parts (a fuse) that can get stuck in the stomach. Keep fireworks out of paws reach and be sure to clean up the aftermath in the yard after you’ve set off your display.